Bali has been known for its wealth of culture, one of which is its traditional architecture that is still preserved and appreciated today. The Balinese architecture is a centuries-old architectural tradition influenced by Balinese culture developed from Hindu influences through ancient Javanese intermediary, as well as pre-Hindu elements of native Balinese architecture. Balinese architecture itself has a main principle namely Tri Hita Karana, which contains three main values, maintaining good relations between human and God, between human and their natural surroundings, and between human and other humans in order to achieve happiness in life. Tri Hita Karana is applied through every part of Balinese people’s life, including its architecture. As we can see that almost all Balinese houses have places like ‘Natah’ or inner courtyard, ‘Pamerajan’ or places of worship, and communal spaces where people gather and socialize. 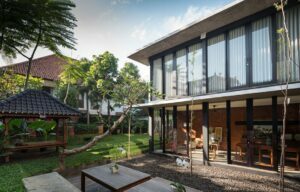 If you are one of the people who uphold the value of philosophy and harmonization between architecture and nature but at the same time also want to remain flexible, then the contemporary Balinese architectural style is the right choice. This contemporary Balinese architectural style embraces the ‘Taksu’ of dwelling or a term the Balinese use for a soul, a charisma, or a spiritual power needed to truly capture the eyes, the minds and the hearts of both human and the divine. Today, contemporary Balinese architectural style is known as one of the most popular Asian tropical architectural concept, much owed to the growth of tourism industry in Bali that create demands on Balinese-style houses, cottages, villas and hotels. Contemporary Balinese architecture combines traditional aesthetic principles, island’s abundance of natural materials, famous artistry and craftmanship of its people, as well as international architectural influences, new techniques and trends. As you walk through Bali, you will see lots of buildings that can be a reference for contemporary Balinese architectural style, especially in commercial and hospitality buildings such as villas and resorts. 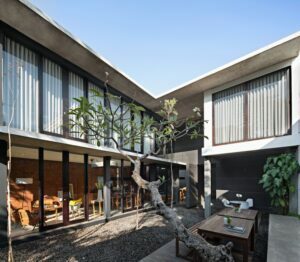 However, it’s better if you could arrange to meet and discuss your project needs with an architect who has the knowledge and skills in contemporary Balinese architectural style to make your dream house a reality. An architect not only will help you in realizing your dream architectural style, but also helps in the material selection, organizing space efficiency, and is able to create a more comfortable and artistic dwelling.